With an already imposing name, the H2 Aviator is the first time HYT creates a timepiece destined for aviation lovers which each step of its concept designed to satisfy aeronautical codes. The H2’s new aviatic garb underlines the piece’s legibility, a defining element for all flight instruments. The path and the colour of the minute hand has been redrawn with its quarter hour indexes enlarged and in red. The central hand underwent the same treatment! 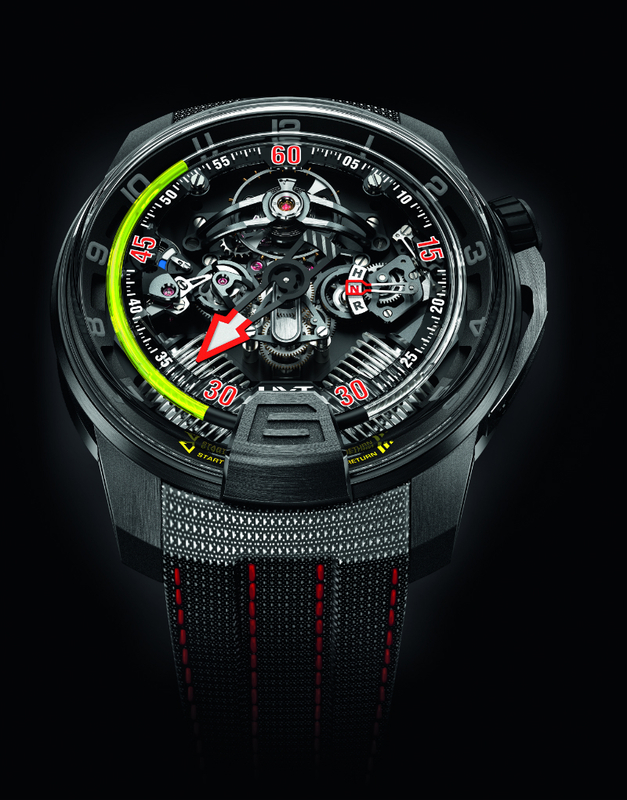 Magnified and tipped by a red arrow, a first for HYT. The crown position indicator (H-N-R) located at 3pm is visible via a window that displays the selected function. To ensure all components shine with maximum visibility they are placed on a DLC treated movement with a satin finish and polished angles. The contrast with the neighbouring chrome is optimal, the reading of the time simple and intuitive. Like all fighter planes the cockpit is functional and extremely visible in this sleek casing. HYT gave priority to a case entirely coated in DLC including the hour indexes that are treated with grey anthracite Super-LumiNova. Consistent with aeronautical codes, the hour is read by a yellow liquid. As with all technical pieces, the H2 has its share of innovations. One of HYT’s leitmotifs is to bring these innovations directly to the wearer: palpably, concretely and immediately. HYT’s latest innovation is a new strap covered in in Kevlar (an aramid synthetic fibre with high tensile strength and temperate resistance, a fibre that can be used in extreme conditions such as clothing for racing car pilots, racing sails, and also in the aeronautical and aerospace industry). - 192-hour (8-day) power reserve. - Luminescent minute hand and hour-markers. Strap: grey/black Kevlar strap with a red stiching, titanium black DLC deployant buckle.